inventors to translate their ideas into patents. 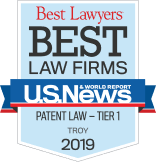 Colleen represents clients nationwide and internationally in all aspects of patent and trademark law, and she enjoys developing patent and trademark protection strategies with her clients. Colleen enjoys developing patent and trademark protection strategies with her clients, helping clients defend, assert, and maximize their intellectual property rights, and working with inventors to translate their ideas into patents. She has represented clients nationwide and internationally in all aspects of patent and trademark law. Colleen has experience drafting and prosecuting domestic and foreign patents, rendering patentability, freedom-to-operate, and invalidity opinions, and providing patent litigation support. Her technical expertise primarily involves the fields of chemistry, materials science, chemical processes, and mechanical devices. Colleen also has experience rendering trademark use and registration opinions, initiating and defending trademark enforcement actions and administrative proceedings, securing domestic and foreign trademark protection, and drafting intellectual property assignment and license agreements. Colleen earned her Juris Doctor degree from Lewis & Clark Law School and a Bachelor of Science in Chemical Engineering from the University of Michigan. She is admitted to practice before the U.S. Patent and Trademark Office.